In this segment, or whatever you feel like calling it, I’m going to take a very brief look at recently released games. By “recently released games”, I mean indie games mainly. Unless you care to send me a game to write about, I’m still rather limited. Anyway, lets get to it. So, boys and girls, do you like weird games!? How about games that are hardly understandable!? Then Crypt Worlds is the game(?) for you! Created by Elizabeth Deadman, maker of other games(?) 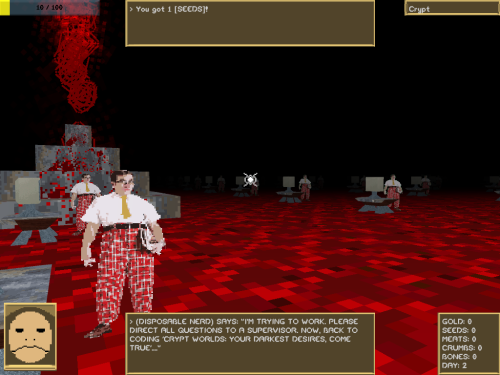 that most sane people have probably never heard of; Crypt Worlds is an adventure style point and click game that takes place...somewhere. I’m not entirely sure, as this is one of the many things that Crypt Worlds sees fit to not tell you about. I really can’t lie, I have no idea what’s really going on in this game. From the games opening cutscene, I’m rather lost and confused. While it does kind of explain what you need to do, I was too busy staring at the evil elephant demon child that was staring at my soul. After you make it through the opening, you find yourself in your home, ready to set forth on an adventure. The game is sure to outline one important fact at the beginning, though: peeing is good. For reasons unbeknownst to me, there is a pee meter that can be emptied in various places. In fact, it’s important enough of a game mechanic to where items can be gained from peeing in certain spots. Why, you ask? Heck if I know. 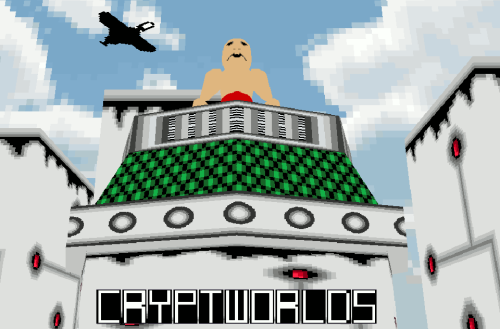 As you step out into the world, you instantly are taken aback by the visually striking art and graphics of Crypt World. By visually striking, I mean Minecraft textures assaulting your eyes with hammers. Yes, I’m aware that this game(?) 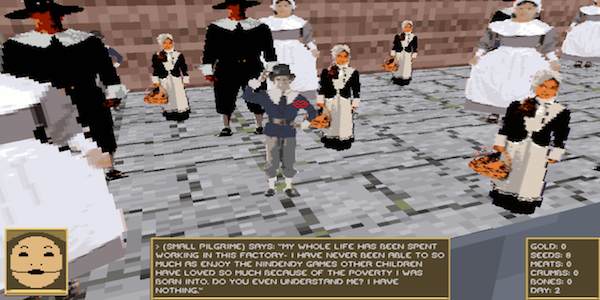 is weird for the sake of being weird, but still; The NPC models are 2D cutouts, why would you even..? Despite the ungodly level of weirdness that this game(?) contains, I will admit, it does make me want to keep exploring. Not because the game has a “vast world” to explore, but mainly because I want to see just how weird the game can get. There’s one point in the game where you can go to “hell”, and find rows and rows of computers, a UFO floating on top of the room, a 2D cut out of Shaggy from Scooby Doo titled “Shiggy Miyamoto”, and a bunch of “nerds” populating the room. Seriously, it’s just so goofy you feel compelled to keep going. That’s pretty much it for this game, though. There’s only so much I can explain without telling you to try the game(?) itself. I’ll include a link to the game below for you all to try, should you want too. Hopefully, you enjoyed reading this.